While perusing through an action figure archive website, I came across two toy lines from the early 90s that brought back memories of a more innocent time in my life… Troll dolls! 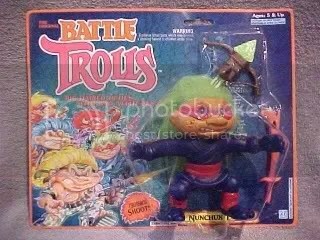 Well, actually, let me clarify, the trolls that I came across were troll action figures! RAAAAAWR !!! They were marketed to strapping young men like me. TAFs (Troll Action Figures) were the meaner, leaner, big brother of all those wimpy “I love you, I’m so precious” troll dolls that become a short-lived phenom at about the same time. These violent trolls were a little less cute and a little more ugly. But they were still kinda cute, in an ugly puppy dog way. 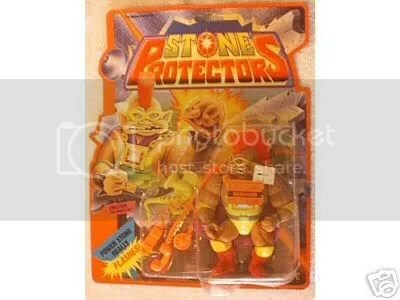 Man, I flipped out when I was reminded of the Stone Protectors! Ace was one of the biggest purveyors of the 90s troll explosion, I remember seeing a commercial every single commercial break when watching FOX Kids in the afternoon. This was my only figure from this line though, and I believe I got it for Easter (childhood Easter tradition usually got me about one action figure per year, in addition to much candy). I loved this toy. It was definitely suited for me because the guy was a professional wrestler! The four other Stone Protectors are kinda lame looking and had jobs such as: soldier, rock climber, samurai (how much does that pay? ), and one of them even had the task of being an “accelerator” (complete with in-line roller skates!). Chester was by far the coolest, although he was a wrestler, he could also pass for the role of superhero. Just look at those rippling bisceps! The triceps! The quadriceps! The octaceps! This man was on the juice, he’d get pushed to the top of WWE in no time. And check out that cool pink Mohawk, I love it! Another great thing about this figure is that his massive arm bended just right so he was perfect for slapping a headlock on my other action figures while they were competing inside my toy WWF ring. Their enemies, you didn’t ask? Zok “the Evil Leader” and Zonk “the Horrible Hatchetman”, whether that was a reflection on his hatchet throwing skills or his disposition, we may never know. A second series followed in 1993 with a really bad sports theme, Chester was turned into a football player for that one. What? Wrestling isn’t a sport? The second series also introduced two more henchmen for Zok: Suckerpuncher (a boxer) and Tackle Jackal (football player). Tackle Jackal just doesn’t sound right. It should either be a brand name for a tackle box or what you call a horny person. Another neat feature of all the Stone Protectors were their flashy little gems on their chest. If you raised one of their arms, it would flash. I always loved that as well. In fact, I’m gonna say that Chester The Wrestler is one of the greatest action figures of all time! Man, it kind makes me wish I did own all of them and it certainly makes me sad that I have no clue whatever became of MY Chester figure. I’m sure it got thrown out by my parents at some point, as did most of my childhood. If the Stone Protectors were around today, I’m sure things would be a bit different. We’d see ‘Chester The Sports Entertainer’, the samurai would become ‘The MMA Fighter’, the soldier would be upgraded to ‘The United States Soldier’ (complete with Old Glory and desert fatigues), the accelerator would be ‘The Extreme Sports Skateboarder’, and finally the rock climber as ‘The Hollywood Socialite’, because that’d be funny. Yeah. A cartoon was made out of (or mostly likely, for) the line, but I don’t remember it airing in my neck of the woods. If you’re like me and you can’t get that Stone Protectors theme out of your head, don’t click HERE. “Big Haired Dudes with Bad Attitudes”, at least that’s what the marketing campaign told us. Battle Trolls came out about the same time as the Stone Protectors, but were quite large. Whereas the Protectors were your usual 5″ or so action figure height, the Battle Trolls stood above all others, probably sizing up at 8 inches or so, but the ladies never complained about that. Again, I only ever owned one and it was Nunchuk. Maybe these action troll lines came and went so quick I never really had a chance to get another figure, who knows, but I do know I was not impressed with the Battle Trolls. Which is a shame seeing as how they came from Hasbro, who usually brought the goods when it came to toys for boys. I honestly thought this was just some cheap fly-by-night company that made these, not Hasbro. These things were just full of rubber awkwardness though, all you could do was move their torso while their arms and legs were stuck in awkward poses. Unless you had a whole bunch more Battle Trolls, and my research shows that surprisingly there were a whole bunch more, you couldn’t really do anything with ’em. They dwarfed (trolled?) every other figure out on the market at the time. Thus, my poor Battle Troll was shunned by me and my other toys and forced to sit one out… for life. I’m really surprised by how many Battle Trolls were released, they even had vehicles, one of which included a pretty sweet looking troll called Bulls-Eye Troll, who is a dark red cyclops with bright yellow hair. Incredible sounding, isn’t he? I’m guessing Hasbro dumped the whole line all out at once though to best exploit the troll craze, because I can’t imagine these figures going anywhere but to the discount racks at KB Toy Stores by mid-’93. I do remember there was one other troll I wanted, called Count Trollula, for the sole reason that he looked like a troll version of Batman, yet nothing like the Dracula-inspired images his name may suggest. I guess ‘Bat Troll’ would’ve been too obvious. They did have a Superman homage called Super Troll though, so who knows. In the end, both lines of action oriented troll dolls showed up to the dance just a little too late. According to Wikipedia (which is never wrong), 1992 was the year troll sales took a hit with the leading troll-makers, Russ, taking a loss of more than $2 million dollars. Okay, alright! So I did own some of those cutesy-wutesy trolls. But they were all gifts, man! Honest! For the uninitiated, Russ made the best darn trolls in the world. PERIOD. Ace had the low-budget troll stuff going on, and were marketing to the after school TV watching crowd, I believe they had the most gimmicks and various lines of troll dolls. Then there was Mattel, which was all about pink hearts, frilly dresses, and the like for their trolls. And finally, Russ had Trolls for the everyman. Every career, every holiday, every meal, Russ had it. They even claim to have the “original” Troll, although I’m not sure how accurate that is when trolls were originally hand carved and sold by a lone Dane in the 60s. And yes, there were many, many more companies that released troll dolls in the 90s, but Russ, Ace, and Mattel were really the headliners during the early 90s craze. In the instance of Ace, its funny how one company can build an empire off one idea, and not have the foresight to diversify their output so that when that one product’s popularity sinks to the core of the earth, the company won’t. Not ha-ha funny, but funny interesting. 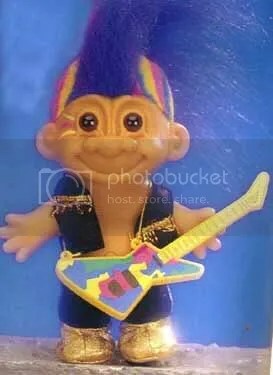 Anyway, this is the Punk Troll. I can’t remember when I got it… Maybe Christmas? Maybe just because? Jenny say paw. I’m guesstimating I’m pretty sure I got this in ’92. 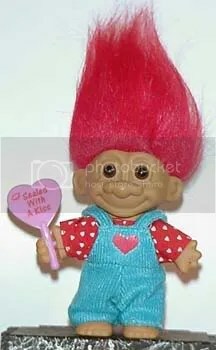 It does have the distinction of being my first ever Troll though, I remember my mom saying she got it for me because it was the one that looked most like a wrestler. He’s got a pretty cool Mohawk going on too. The rainbow of colors on the side of his head reminds me of sherbert, and sherbert is good. Anyhow, this Punk Troll isn’t a toy. Trolls are dolls, and all you can do is just look at ’em. Even if he does has C.C. DeVille’s guitar. Alright, now we’re talkin’! We’ve moved onto the holiday trolls! I actually don’t think I even have this one anymore, but it was a nice gesture by my mom regardless. I’m a bit fuzzy on the date I got this one as well, but I’m fairly certain it was 1994, because I also remember getting beef jerky at the same time as my Valentine’s Day treat from my parents. In any event, I think the heart eventually broke off it’s stick. This may still be around somewhere, but I doubt it, I haven’t seen it in ages. THIS was the type of troll you really had to hide from your friends if you were a guy. Battle Trolls, Stone Protectors, and even the Punk Troll (based solely on the fact he’s called a “punk”) may pass the test, but this would earn you no favors with your friends. Yes! 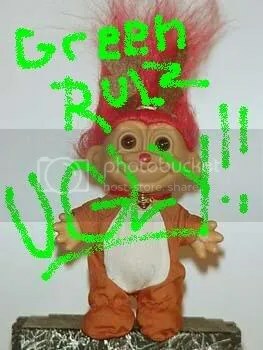 If we’re talking about “real” troll dolls and not TAFs, this would have to be my favorite of all I’ve ever seen. 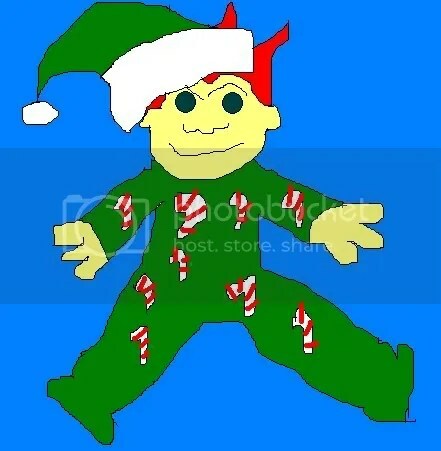 Its CHRISTMAS themed, darn it! I still break this out around the holidays and let it sit on an end table or something. I love it. Now, there is an alternate version where the only difference is red hair. But I prefer this one, if you’ve already got a red nose, why do you need read hair? It’s Christmas! Work some green in there, buddy! 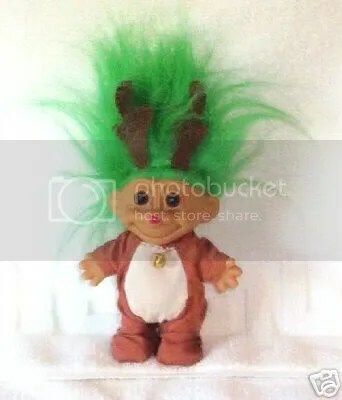 Maybe the green Reindeer Trolls are rare because I had a heckuva time trying to steal find a picture of one. Awww… look at that, he’s even got a little jingle bell around he neck. How cute!! The Sleepy Time Christmas Plush Troll !! So that ends today’s trip down memory lane. I’m pretty sure trolls are still around in some form or another. I don’t think they’ll ever go away, and they’ll probably keep getting spikes in popularity every decade or so. I do know that Russ has apparently “retired” their line of trolls. But who knows, maybe the next bit of troll madness is right around the corner and they’ll be back? Remember, good Trolls never die, they just get canceled. Until next time, I’m the Metal Misfit, take care of yourself… and each other.